Note: All students must consult their academic and/or faculty advisor prior to registration for assistance in selecting their courses for the semester or term. At Harris-Stowe State University, registration is a process involving actions by the student with several departments, including: Admissions, Academic Success, Financial Assistance, Bursar, Registrar, and Public Safety. These actions require that students enroll and secure financial arrangements to complete the registration process. In-person registration is required for some internship, senior synthesis, student teaching, and mathematics courses. Students must register for courses not authorized for online registration with the Office of Academic Success (HGA Room 008). For online registration, go to: https://live.hssu.edu/ics. Registration instructions may be found in the Quick Links options on MYHSSU or the current student’s homepage. Generally, students who have “holds” on their University record are not eligible for registration. Students with financial probation “holds” may appeal this status, in writing, to the Office of Financial Assistance. Students securing financial clearance utilizing the University’s installment agreement must comply with the payment deadlines as established in the agreement. The University reserves the right to cancel the registration and administratively withdraw any student who fails to secure financial clearance by the noted deadline. A student may obtain an official copy of his or her Harris-Stowe State University record from the Office of the Registrar. Official transcripts bearing the signature of the Registrar are issued to other educational institutions and employing agencies upon the written request or authorization of the student. Official transcripts may be issued directly to a student, but will bear the notation “issued to student.” Transcripts are issued in their entirety; no partial transcript will be issued. No official transcript will be issued to or for a student who is indebted to the University, until such indebtedness has been paid in full. Current students may access unofficial transcripts through the online portal, MYHSSU. These enrollment options are subject to the restrictions set forth in the previous sections. In such cases, the auditing student will not be given either a grade or credit for the course, unless he or she has applied in writing prior to the University’s official census date and has been officially approved by the University administration for a change to either a CR/NC or Graded status. Mini-courses, workshops and institutes may be taken under audit status, but the auditor is not permitted to convert such courses from audit to credit status. Under no circumstances may a student change his or her status in a course for which he or she has previously received a passing grade. Subject to the availability of space, Harris-Stowe students who are sophomores or higher and who are enrolled at Harris-Stowe in 12 or more credit hours, may apply for course offerings at Saint Louis University. Eligible and interested students must apply in the Office of the Registrar by using the appropriate application form. 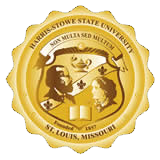 In general, the St. Louis University course applied for must be one that is not offered at Harris-Stowe or one that is offered very rarely and is a required course in the student’s degree program at Harris-Stowe. Note: Students planning to enroll in inter-institutional exchange courses must first consult with the University’s Registrar. The maximum number of credit hours that a student may take at St. Louis University under the Inter-institutional Exchange Program, during any given semester or term, is three. The maximum number of credit hours that can be taken during the student’s study at Harris-Stowe, whether as a classified or unclassified student, is six. Finally, it must be noted that no inter-institutional exchange courses may be taken during the summer sessions; moreover, all such courses must be undergraduate level courses. Credit hour enrollment at the cooperating institution is limited to half of the student’s current credit-hour load at the home institution. However, the enrollee’s credit hours at the cooperating institution cannot exceed a total of 12 credit hours during the student’s entire enrollment at the home institution. Moreover, the home institution’s degree residency requirements must be met, where applicable. Note: The 12 credit hour limitations on inter-institutional exchange courses may be waived by the mutual consent of both institutions for some selected areas of specialization and major areas. However, the 50% course load residency requirement per semester and the individual institution’s degree residency requirements, where applicable, must be met. It must also be noted that there must be an emergency situation which justifies the student’s seeking to take a course(s) under the Inter-institutional Exchange Program. Whatever the emergency circumstances might be, the student must provide proof through documentation. The State of Missouri’s Code of Regulations sets forth the criteria and requirements for decisions related to the residency status of students, including the determination of student fees and of student eligibility for financial aid. Interested persons should review Section 10-3.010, of the Code of Missouri State Regulations, available in the Office of the Registrar, HGA Room 007. Following the review, the application process may begin. To receive in-state credit hour benefits, an applicant must have domiciled in Missouri continuously for at least one year immediately preceding the academic term for which in-state fees are being sought. The applicant must also have the intent to remain in Missouri indefinitely. Note: Harris-Stowe State University utilizes all of the resources available, in order to reach an accurate determination regarding an applicant’s Missouri residency status. Such information includes, but is not limited to information provided on the student’s admission documents, his or her financial aid records, income sources, academic history and pertinent tax records. It is incumbent upon the applicant to provide all information in his or her possession which might assist in residency determination efforts.